This week Xilinx is making public its latest internal project for the next era of specialized computing. The new product line, called Project Everest in the interim, is based around what Xilinx is calling an ACAP – an Adaptive Compute Acceleration Platform. The idea here is that for both compute and acceleration, particularly in the data center, the hardware has to be as agile as the software. Project Everest will combine Xilinx’s highest performing next-generation programmable logic along with application processors, real-time processors, programmable engines, RF, high-speed SerDes, programmable IO, HBM, and a custom network-on-chip. The idea is that space typically devoted to hard blocks in FPGAs (such as memory controllers) are now optimized on chip, leaving more programmable silicon for the compute and adaptability. Project Everest is one of the Three Big Trends as identified by Xilinx’s new CEO, Victor Peng. For most of the consumer market, CPUs and GPUs take up most of the processing within a system. In the data center, FPGAs are also used as a third level of compute, typically as an agile processor to assist with acceleration, and the premise is that it can be configured on the fly for an optimized compute pathway without having to spend tens of millions to create custom chips or ASICs. If an FPGA were to emulate a CPU or a GPU, it would ultimately be slower or draw more power, but typically the way CPUs and GPUs are configured are not always the best pathways for a lot of compute, and FPGAs are typically used as network accelerators or as a hub for things like semi-conductor design, emulating how other chips are built, or novel cryptographic compute workloads. If you need an FPGA with more memory for example, then the programmable logic can construct a memory controller, such that an embedded implementation with a PHY will give access to more memory. Of course, this is a simplification. FPGAs, are by design, PCIe co-processors, much like GPUs. The workflow is somewhat similar as well after the circuit is designed: develop the code and run the data through using APIs. In recent product cycles, Xilinx has bundled new features to its FPGA line, such as hardened memory controllers supporting HBM, and embedded Arm Cortex cores for application-specific programmability. What Project Everest aims to bring to the table is another form of processing unit, combining a number of features but going beyond the current CPU/GPU/FPGA paradigm: the Adaptive Compute Acceleration Platform (or ACAP). Xilinx’s ACAP portfolio will be initiated with TSMC’s 7nm manufacturing process, with the first tapeouts due in late 2018. Xilinx states that Project Everest has been a monumental internal effort, taking 4-5 years and 1500 engineers already, with over $1b in R&D costs. The final big chips are expected to weigh in at 50 billion transistors, with a mix of monolithic and interposer designs based on configurations. Today’s announcement is more of a teaser than anything else – the diagram above is about the limit to which that Xilinx will talk about features and the product portfolio. 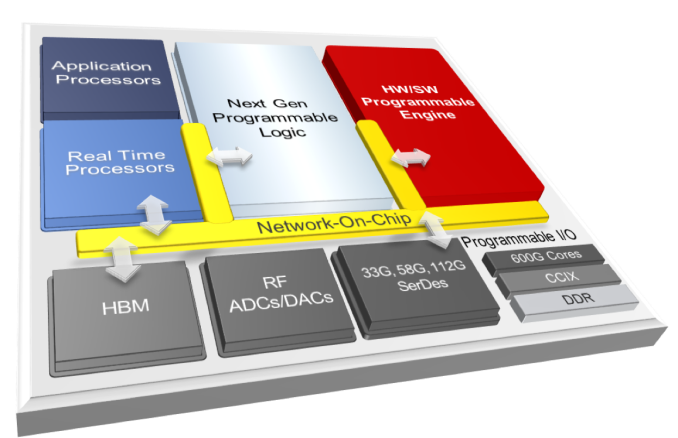 The value of the ACAP, according to Xilinx, will be its feature set and millisecond-level configurability. For a server on the edge, for example, an ACAP can use both the programmable logic elements for millisecond bitstream reconfiguration of different processes along with the application processors for general logic or the programmable engines as ASIC-level acceleration. This can lead to, among other things, different AI acceleration techniques and 5G RF manageability by multiple containers/VMs on a single ACAP. The overriding idea is that the ACAP can apply dynamic optimization for workloads, with Xilinx citing a 10-100x speedup over CPUs and more use cases than GPUs or ASICs as a fundamental value to the new hardware, built through software and hardware programmability. Xilinx also stated that the RF will have four times the bandwidth of current 16nm radios, leveraging 16x16 800 MHz radios. Xilinx did mention two specific features that will be coming to Project Everest. 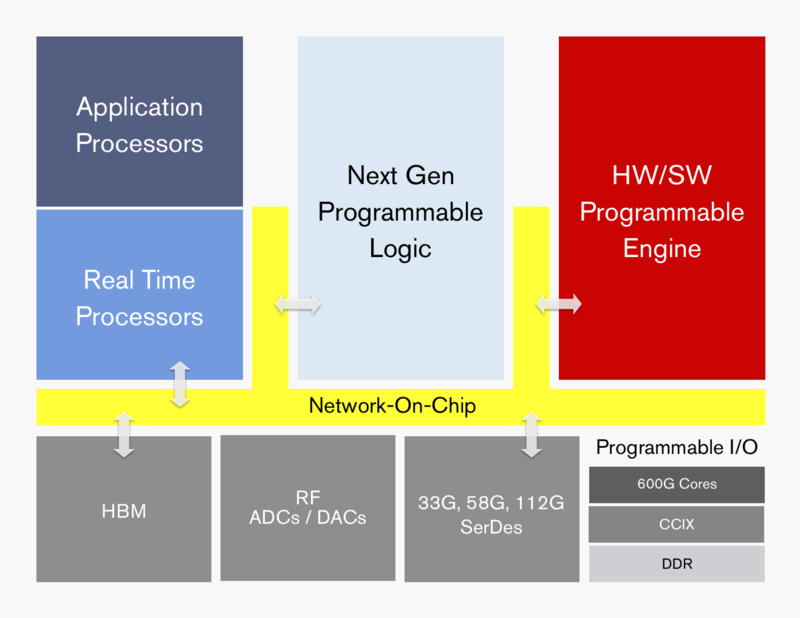 The chips will have ASIC-level blocks for CCIX connectivity – a cache coherent interconnect that promises to be the ‘one bus to rule them all’ (quote from Charlie at SemiAccurate), although Xilinx does not go into direct detail about the bandwidth. Xilinx does however mention its SerDes capability, going up to 112G PAM-4, which Xilinx demonstrated only this week at an Optical Fiber Conference. Xilinx did not state whether Project Everest will use integrated or external transceivers, however, and we will have to wait for a bigger announcement later in the year. The ultimate goal, according to Xilinx, is for the ACAP to be a universal accelerator. 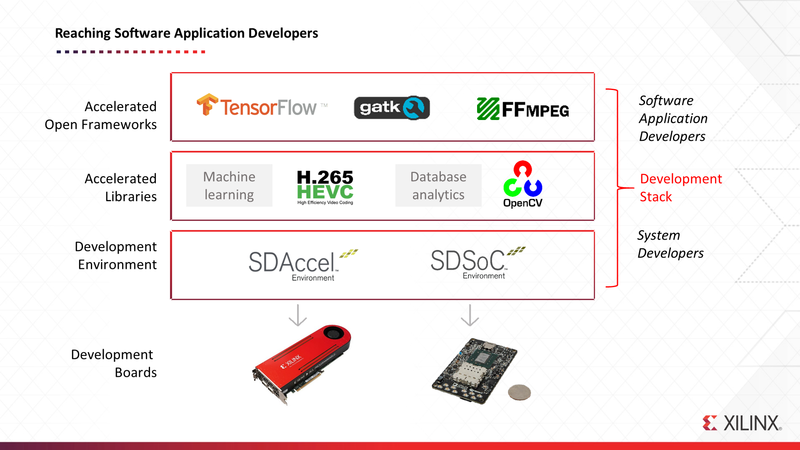 The six areas that Xilinx provided as examples were for live streaming, sensor analytics, AI speech services, social video screening, financial modelling, and personalized medicine: the idea is that the ACAP can tackle all of these on the fly as a result of its feature set, hardware and software programmability, embedded connectivity, and onboard accelerators. Xilinx is still formulating a brand name for its Project Everest products, and as mentioned above, there is expected to be a range of monolithic and interposer enabled options. Tapeout is expected in 2018, with products in 2019, using TSMC’s 7nm. This means that the first products are likely to be the high-performance, high-margin numbers. Xilinx has no direct plans at this time to bring the ACAP strategy back to 16nm or larger. Key strategic customers are already engaging Xilinx on the project. If my employer told me to go take a week, do a course and learn a new skill, it would be to learn how to use FPGAs. I was never exposed to them much during my academic career, especially when GPUs were only just coming through as the compute platform of choice for parallelizable code. Since FPGAs and FPGA-like devices hit the market, one thing has been clear – the user has to be more of a hardware engineer than a software engineer to get to grips with them. Xilinx has seen this as a sizable barrier for entry for its product line, and part of the revised methodology under new CEO Victor Peng is to enable a new wave of users by reducing this barrier. One of the topics in our briefing discussed alongside Everest was how to drive that new generation. The goal, according to Xilinx, is to get developers used to the FPGA as ‘just another PCIe co-processor, like a GPU’, and enable it to be programmed as such. As a result, Xilinx is pursuing a strategy of accelerated libraries, much like what has happened in the GPU space. The ultimate goal is that a developer can take a library, which has the necessary resources to configure a bit-stream on the fly and implement it to the hardware at hand, and just use it – all the FPGA reconfiguration happens at a level below what the software developer needs. So far Xilinx has been working on accelerating AI frameworks, codecs, machine learning, and database analytics, in this way. Developers still have to target the SDAccel and SDSoC software development environments, but it was clear that enabling this higher level of users is in Xilinx’s portfolio for the future, especially when an ACAP can be hardware and software configurable. The briefing we had on Project Everest, because it still is early for the product line, was ultimately a chance for the company to introduce the new CEO. Bundled with this were a reformation of Xilinx’s priorities within the presentation and discussions. We have an interview with Victor Peng on the next page, but it is worth at least enumerating how Xilinx is set to approach its future. Xilinx’s key headline that it is focusing on being a ‘Data Center First’ company. We were told that the company is now focused on the data center as its largest growth potential, as compared to its regular customer base, the time to revenue is rapid, the time to upgrade (for an FPGA company) is rapid, and it enables a fast evolution of customer requirements and product portfolio. Peng stated that Xilinx is a company that can approach compute, storage, and networking, and have a product for all three. Part of the key to being a major data center player will be the software, as discussed in the section above, but also connections with technology such as CCIX, and enablement through service providers with ‘FPGA as a Service (FaaS)’ in cloud infrastructures. Xilinx cites enterprise customers already deployed and using their hardware to afford a 40x inference speedup, a 90x analytics speedup, and a 100x genomics speedup. Use cases include personalized medicine (genomics analysis in 20 minutes, not 24 hours), computational storage, and Smart NICs for NFV. The second element to Xilinx’s focus was to ‘Accelerate Growth in Core Markets’. So for everything that isn’t data center, and core to Xilinx’s historic and future business, the idea is to get more. We were told that these markets, such as automotive, broadcast, aerospace, infrastructure, and industrial, were looking towards embedded platforms rather than custom solutions to fit their goals. This is apparently a change from the previous generation of implementations, spurred by the availability, cost, and power, of compute. A number of these markets also rely on software defined implementations, requiring the hardware underneath to be adaptable and configurable in a transparent way. The third element to the strategy is Adaptive Computing. 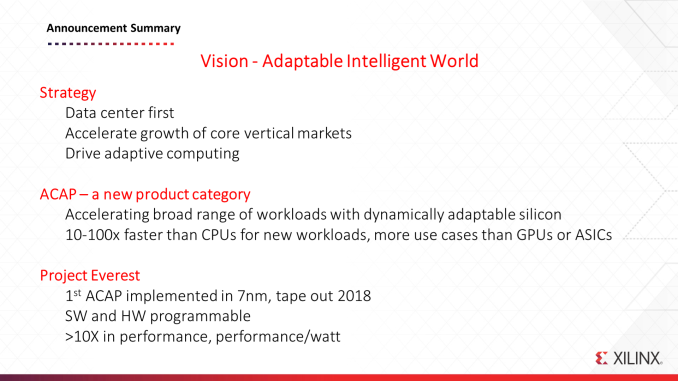 The future of this strand lies in development of things like the ACAP and Project Everest, as well as deployments of current generation products, such as the Virtex UltraScale+ units with HBM announced a while back. On the next page we had a chance to discuss Xilinx with the new CEO. You're right, up to this point it has been a win-win. We've gotten huge logic increases at a fraction of the cost from 10 years ago, and Xilinx has supported us well. My worry was this statement below from the article. If you're a low volume customer that needs a device for 10 years you might be SOL in the new era of semiconductor vendor consolidation. They're all chasing the big markets to pay for their billion dollar developments: 5G, datacenter/networking, autonomous vehicle, etc. Also, sometimes you need to know what's inside these vendor HDL/SW black boxes so using them get's tricky. That being said, FPGA's naturally scale across a number of broad markets and the vendors don't have to make as many tough product line choices as ASIC's. Xilinx's HLS capabilities give decent results especially if you're at the prototyping stage for processing algorithms. The HLS tools from Mentor and Cadence are highly praised by ASIC developers but if your company is able to justify 6 digit license costs per seat per year. Intel's HLS tool just came out of beta so it's probably not worth using right now. Intel's OpenCL framework has been out for a while but I haven't personally used it. For their data center oriented framework, Intel has their OPAE (https://01.org/OPAE) software/driver stack coupled with the rest of their acceleration stack (https://www.altera.com/solutions/acceleration-hub/... Their hope is that the SW dev just writes the user application and the RTL person (maybe the same person) just creates accelerator modules (via HDL, HLS or OpenCL). It would be interesting to know just how much data center business Xilinx actually does. As a point of comparison, Dini Group's president said last year they've had zero sales with their data center oriented products. >The idea here is that for both compute and acceleration, particularly in the data center, the hardware has to be as agile as the software. This makes no sense given the properties of hardware development not catering to the adaptive, evolving nature of development in an agile philosophy but I suppose throwing everything and the kitchen sink at a problem is as close as you can get to an 'agile' solution in hardware development. >In recent product cycles, Xilinx has bundled new features to its FPGA line, such as hardened memory controllers supporting HBM, and embedded Arm Cortex cores to for application-specific programmability.